After an invocation by a Latter-day Saint at the Republican National Convention, Mitt Romney accepted the nomination. Editor’s Note: An earlier version of this story ran last year, as part of a series about the faith lives of the leading Republican presidential candidates. With the exception of an August interview done by CNN Chief Political Analyst Gloria Borger for her documentary “Romney Revealed: Family, Faith and the Road to Power,” which airs Sunday, October 28, and Saturday, November 3, at 8 p.m. ET on CNN, all other interviews were conducted in the fall of 2011. CNN has also profiled President Obama’s faith life during his time in the White House. The man at the Citroën’s wheel was Mitt Romney, who may have appeared dead but was very much alive – as is his hope to become the next president of the United States. Romney was serving as a missionary for The Church of Jesus Christ of Latter-day Saints, or the LDS Church, when tragedy struck. It was a time of turmoil both in France and in the United States. Protests against the Vietnam War raged on, as did French disdain for Americans. Robert Kennedy had recently been assassinated, as had Martin Luther King Jr. a couple months earlier. France was still reeling from a May marked by riots, student demonstrations and crippling worker strikes. There were six people in the car Romney was driving when friends say an oncoming speeding Mercedes, driven by a Catholic priest, veered into his lane. Among the passengers was mission president Duane Anderson – Romney was serving as his assistant – and Anderson’s wife. Anderson was injured, and Leola Anderson, 57, was killed. Like her husband, she’d been a parent figure to the approximate 180 Mormon missionaries in the field - their surrogate mother away from home. Now, she was gone. The mission president left France for six weeks to bury his wife and heal. A gloom spread over the mission field. Conversions in the country dropped, along with Latter-day Saint spirits. These young men and women, who were already deep in a trying spiritual rite of passage, had to grow up and prove themselves in new ways. In spite of his grief and a broken arm, Romney and a missionary companion – they always work in pairs – took charge. They traveled around the country visiting the others. Romney lifted up deflated missionaries with silly made-up songs. He taught them to visualize all they could accomplish and challenged them to raise their expectations, McBride said. Romney increased the conversion goal for the year by 40%, believing France’s Mormon missionaries could and would recharge. In the end they surpassed Romney’s goal of baptizing 200 new members into the church. It wasn’t such a stretch, though, for Romney to distinguish himself. Throughout his life, he’s been rooted in a faith that – whether he talks about it or not – helped shape the man who would president. Romney hopes the nation is ready to embrace a president who happens to be Mormon. But he has faced questions about his faith since first getting into politics in 1994, when he ran for U.S. Senate in Massachusetts against Democratic stalwart Ted Kennedy. When Kennedy’s nephew, Joe, attacked Romney’s Mormonism, the insult drew a strong public response from Romney’s father – a former governor of Michigan who’d himself run for president - and failed to gain traction. Since then Romney, who was elected governor of Massachusetts in 2003, has played down his faith on the campaign trail. But he did address it in a December 2007 speech, hoping to stem voter concerns about his religion and how it might influence him as a president. It was a speech he likened to John F. Kennedy’s famous 1960 address, when Kennedy was running to be America’s first Catholic president. Whether Romney’s confession of faith helped sink him is a subject of debate. He hoped to deflect the focus on his religion while not speaking to Mormon doctrine or specific beliefs. In the whole speech, he mentioned the word Mormon only once. And only after a sit-down meeting earlier this month with the Rev. Billy Graham and his son Franklin Graham, did the cult reference to Mormonism get scrubbed from the Billy Graham Evangelistic Association’s website. It’s hard to know how much Romney’s faith matters to the public, but recent polls suggest that at least to the majority of voters, it makes little or no difference. A survey released in late July by the Pew Research Center showed that 60% of voters knew that he was Mormon, and of those who knew 8-out-of-10 were either comfortable with his faith or didn’t really care. Another survey by Pew showed that only 16% of voters wished they knew more about Romney’s religious beliefs. Far more hungered for further details about his tax returns and his records as governor and at Bain Capital. But in a tight election, if even a small minority of Americans withhold their votes from Romney because of his religion, it could cost him the White House. For months, Romney’s campaign made it clear that it didn’t want to discuss his beliefs. Repeated attempts last fall to speak with the candidate, his wife, his children, his siblings - and, really, just anyone – about Romney’s faith journey were denied by campaign headquarters. Even the reins it had on those outside the inner circle appeared tight. A local LDS Church leader in Michigan, contacted in hopes of finding childhood friends, forwarded CNN’s inquiry to campaign headquarters - prompting yet another slap down. But Romney has been somewhat more open about his religion since then. He and his wife, Ann, sat down separately with CNN Chief Political Analyst Gloria Borger for her documentary, “Romney Revealed: Family, Faith and the Road to Power,” which first aired just before the Republican National Convention. In the documentary, Romney shared how his mission in France fortified his faith and how church leadership roles in Boston would later strengthen his beliefs further. He invited reporters to attend church with him in August, allowing the unremarkable typical Sunday service to speak for itself. People who’ve known him through the LDS Church took center stage at the convention, speaking to his character. 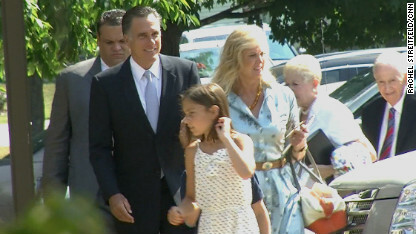 In August, Romney invited members of the press to join him for Sunday LDS Church services. But Romney generally moved through the campaign guarding details about his Mormonism. He spoke about religion in broad strokes. He continued to avoid details and doctrine. During a May commencement address at Liberty University, the Christian school founded by the late Rev. Jerry Falwell, he didn’t utter the M-word. Under the watchful eyes of millions as he accepted the Republican nomination for president in August, he said it once. 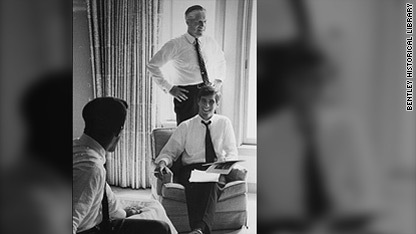 The 19-year-old Mitt Romney who showed up for missionary training was different than the rest. Romney, like many of the other young men called by church leaders to serve, had finished a year of college before he got his missionary calling. But he’d gone to prestigious Stanford University and came from a privileged and powerful background. Despite the comforts he’d known growing up, Romney wasn’t spoiled. Some apartments that housed missionaries around France lacked heat and water, but had plenty of fleas. Those sorts of conditions likely made Romney appreciate all the more the luxuries of the mission home, located in the ritziest part of Paris, where he worked and lived during the latter part of his two-and-a-half year mission. He and the others there were fed by a Spanish cook and enjoyed the benefits of maids. What’s more, said fellow missionary and friend Dane McBride, the young men learned what time of day to peer through windows to watch Brigitte Bardot walk her poodles. The scenery aside, “it was the nicest office I ever worked in,” said McBride, now an allergist and immunologist in Roanoke, Virginia. Throughout his mission, Romney was the first to get out of bed each morning, forever focused on his goals and the lessons he’d teach, and he stayed gung-ho even when others faltered, Hansen said. Romney didn’t shy away from approaching anyone. On Saturdays, a free day for missionaries, he’d be done with his laundry by 9 a.m. and coaxing everyone else out the door for bike rides in the mountains, tours in new places or football games. He was both pragmatic and creative when it came to sharing Mormon teachings, McBride said. However, Romney was a big proponent of what McBride called “creative contacting.” In lieu of going door-to-door, he preferred to encourage conversations by building sidewalk kiosks or inviting French locals to play baseball or attend evening parties with American themes – complete with Western wear and guitar strumming. Being a missionary in largely secular France deepened Romney’s faith because it forced him to wrestle with challenges, steep himself in study and prayer and face plenty of rejection, McBride said. Like others, Romney was no stranger to doors being slammed in his face or getting his behind kicked while heading down apartment stairwells. “When you’re off in a foreign place and you only talk to your parents once or twice a year by phone – that’s all that’s allowed – and you’re out speaking to people day in and day out about your faith and your religion and differences between your faith and other faiths…you say, ‘OK, what’s important here? What do I believe? What’s truth? Is there a God? Is Jesus Christ the son of God?’” Romney said to Borger in August. The groundwork for Romney’s faith journey was laid long before he put on a suit and, armed with his Book of Mormon, boarded a flight for France. He comes from a long line of Latter-day Saints. Those who like to highlight what makes him different might point to how one of his great-grandfathers fled to Mexico, about 125 years ago, amid U.S. government crackdowns on what Mormons refer to as “plural marriage.” But many multigenerational Mormon families have polygamists in their family tree. Plural marriage was introduced by church founder Joseph Smith but was officially banned by the church in 1890. Some 38,000 people aligned with fundamentalist offshoots of the LDS Church still practice polygamy, but they are a far cry and completely separate from the 14 million worldwide members in Romney’s church. Romney’s late father, George Romney, was from modest means. He was born in Mexico to monogamous U.S.-born parents and left during the Mexican Revolution when he was 5. He went on to be CEO and chairman of the now-defunct American Motors Corporation, governor of Michigan and a presidential candidate in 1968. Mitt Romney with his father, George Romney, who made his own mark as a leader in business, the LDS Church and politics. Growing up Mormon in Michigan made Mitt Romney a member of a distinct minority. There were fewer than 8,000 Mormons in the state in 1945, two years before he was born, according to the LDS Church. It’s been reported that he was the only Mormon in his high school. While Mormon students in Utah could simply stroll across the street from school to attend early morning seminary before the first bell, longtime friend McBride said Romney didn’t have that easy, built-in outlet to strengthen his faith amid peers. Romney’s family, though, was active in the church. In 1952, his father was named Michigan’s first stake president. A stake is comparable to a diocese and has under its umbrella multiple “wards” or congregations, much as a diocese consists of parishes. The LDS Church does not rely on professional clergy. Instead, church members are called to serve as volunteer leaders while holding down paid jobs. Church leaders rely on other volunteers as advisers. For instance, a ward bishop has two counselors, while a stake president confers with a high council of 12. 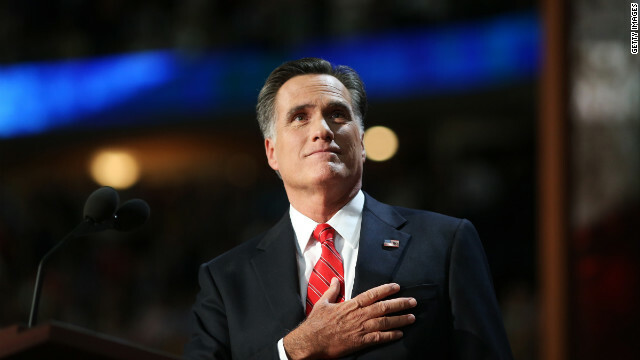 Being Michigan’s sole stake president meant Romney’s father – in addition to his full-time corporate work – oversaw ward operations, was the spiritual guide for the Latter-day Saint community and relayed messages from church headquarters in Salt Lake City. Like many practicing Mormons, the Romneys enjoyed “family home evening” every Monday, a time reserved to pray, study and sing together, McBride said. Romney has spoken publicly about how his parents took him and his three siblings on mobile American history lessons, McBride said, loading up the family Rambler for cross-country tours to national parks, with stops at places like Mount Rushmore, Valley Forge and Williamsburg. But McBride said the family also likely visited LDS historical sites, including points along the path westward traveled by Mormon pioneers who followed the call of Joseph Smith’s successor, Brigham Young, and trekked through treacherous conditions to arrive in 1847 in what is now Utah. While Romney’s parents made sure their children were deeply connected to their country and their faith, Romney didn’t reside in a Mormon bubble. He was part of a bigger and more diverse world. Ann Davies, the woman he fell for and now calls his wife, was Episcopalian when he met her during high school, and he knew she was the one for him. After he left for college and then his mission, she began studying Mormonism, attended church with Romney’s parents and converted. Romney returned from France and proposed to her immediately. After a civil ceremony in Michigan, the two were married and “sealed” for eternity in 1969 during a sacred ceremony in the Salt Lake Temple. The couple returned to college and began a family at church-owned Brigham Young University in Provo, Utah, before moving to Boston, where Romney earned law and business degrees at Harvard. Romney rose in local church leadership while making his corporate mark. Along the way he applied many of the skills he’d displayed earlier, including his knack as a young missionary for turning challenges into possibilities. Romney delivered sermons, counseled couples, and made middle-of-the-night hospital runs. He monitored budgets, weighed welfare needs of immigrants and others, and drove outreach to different faith communities. He showed up at the homes of Latter-day Saints in need of help, taking on tasks such as removing bees’ nests. Philip Barlow, a professor of Mormon history and culture and the director of the religious studies program at Utah State University, served as a one of two counselors to Bishop Romney in the early 1980s. Each Saturday, the counselors would meet with Romney in his home in Belmont, a suburb northwest of Boston. And while the work was serious, it didn’t mean Romney always was. Barlow recalled the time Romney busted out with a rendition of Michael Jackson’s “Billie Jean” and did a formidable moonwalk across the floor. Romney also was the kind of leader who built bridges with those suspicious of Mormons. When a chapel under construction in Belmont burned to the ground amid ongoing anti-Mormon sentiment, he turned the perceived arson attack into opportunity. “It was an inspired move,” said Grant Bennett, who at one time served as a counselor to Romney when he was a bishop and later served on the Boston stake’s high council under Romney when he was president. Non-Mormon houses of worship offered their buildings to accommodate the needs of the displaced Latter-day Saints during the chapel’s reconstruction. While it would have been easier to pick one place to call a temporary home for services, classes and meetings, Romney accepted every viable offer he received – thereby forcing a rotation of interaction with different faith communities. Experiencing the kindness of strangers offered relief to Mormons who had been feeling “a little under siege,” said Bennett, who first got to know Romney through church in 1978 and worked with him for five years at Bain & Company, the global consulting firm that Romney eventually led as CEO. It was the sort of decision perhaps born of being in the minority in Michigan and learning early to honor religious pluralism, said Bennett, now president and CEO of CPS Technologies, a high-tech manufacturing firm in the Boston area. On the campaign trail and with media, Romney has tried to focus on matters other than faith. In his religious roles, Romney had to delegate and call others to serve. Sometimes he believed in people more than they believed in themselves. Andy Anderson, a retired researcher and writer in Kaysville, Utah, first got to know Romney amid tragedy. It was Anderson’s mother who was killed in the 1968 car wreck in France, and when his father returned to Paris, Anderson, his wife and children went along. When Romney later moved to Anderson’s neighborhood in Massachusetts, Anderson said he helped Romney and his family settle in. In 1989, Anderson said he was minding his own research business when Romney, then the Boston stake president, called him for a meeting. A group of new converts Anderson described as “Cambodian boat people” – united formally as a “branch,” which is smaller and less developed than a ward - had suddenly lost its president without warning. Anderson said he’d been raised to accept church callings. But between the language barrier with the Cambodians, the cultural differences, the poverty and the responsibility, this one seemed too much. He begged and pleaded with Romney. He told him he was unqualified, that he’d “never been president of anything.” He said, “It sounds like a really bad fit, Mitt.” But Romney wasn’t swayed. The Romney reviews from Latter-day Saint women in the Boston area were more mixed. In the early 1970s, as the feminist movement gained steam, a group of Mormon women began gathering in Cambridge to explore the history of women in their church. They were looking for role models, stories that would inspire them. “We were reading about women we’d never heard of before,” said Dushku, a Suffolk University professor of government with an interest in gender and comparative politics. She and other “founding mothers” were moved to start a new publication, now a quarterly magazine: Exponent II. That decision, however, was not received well by the LDS Church, Dushku said. She said the fact that it was independent and had no stamp of approval from church higher-ups, all of them men, rubbed some - including Romney - the wrong way. Dushku said Romney encouraged friends to tell their wives not to participate. He made it clear he didn’t want the women behind the publication holding meetings on church property. Dushku and the others suspected it was under his direction that copies of the magazine displayed in congregations got dumped in wastebaskets. The LDS Church is patriarchal in nature. Only men can serve as bishops, stake presidents and in higher leadership roles, including the combined post of church president and prophet. Only men are welcome in the priesthood, which in Mormon circles means having the authority, for example, to perform baptisms and offer sacramental blessings. Dushku decided she could live with this and remains a faithful Mormon. She said she and the others simply wanted an outlet for women to discuss issues unique to them. And while what they created may have seemed “radical” back then, she says there are Mormon women bloggers today who push boundaries much more than Exponent II ever did. What got to Dushku about Romney was less his reaction to the magazine and more how she saw him treat women he was in a position to comfort and support as a local church leader. Dushku has told the story of a woman, a mother of four, who was pressured by then-Bishop Romney to go forward with a pregnancy despite advice from doctors that a medical complication made it too dangerous. She also recalled the story of a meeting between Romney and a woman whose ex-husband had been excommunicated from the church because of numerous affairs he’d had while serving as a bishop. The woman asked Dushku to accompany her to the meeting, where Romney encouraged the woman to forgive her philandering ex so he could be re-baptized into the church and marry another woman. The problem, Dushku said, is that the husband had never bothered to apologize to the wife he’d hurt, a fact she said Romney didn’t seem to care much about. When she began speaking out to media, Dushku said she was flooded with responses from Facebook friends. Most of the reactions were positive, thanking her for her courage. But some friends suggested she back off. Dushku said she affords Romney the possibility he may have changed, that he might handle such situations differently today. Her take on Romney, though, doesn’t jibe with that of Helen Claire Sievers, executive director of Harvard’s WorldTeach program, which brings volunteer teachers to developing countries. Sievers, who’s been involved with Exponent II on and off since its inception, was the Boston stake activity director when Romney was stake president. She recalled being at a meeting in Dushku’s house in Watertown, outside of Boston, when women began wondering aloud about how their local church might better empower women. “Often leadership in the Mormon church tends to pull far to the right, to out-orthodox the orthodox,” said Sievers, who later proposed to Romney that he should meet with the Boston LDS women to hear their frustrations and suggestions. Romney was willing to have such a meeting, even though it bucked the comfort level of church headquarters. “I was really impressed that Mitt felt strongly that even if he could get in trouble with the hierarchy, he really wanted to hear what the women that were under his stewardship had to say so that they would feel as comfortable as possible in church,” Sievers said. As a result of the meeting, which drew more than 150 participants, Sievers said adjustments were made, including allowing women to say opening prayers at church meetings. Romney didn’t have the power to change church doctrine, but Sievers said he could and did bend the norm to make women feel heard and more respected. “Many Mormon men wouldn’t make that choice,” she said. In his fulltime work life, Romney showed that his commitment to serving others extended beyond those in his ward or stake. His religious values came through in business decisions – sometimes trumping opportunities for financial gain. Robert Gay, who was once a managing partner at Bain Capital, the venture capital firm Romney founded, recalled how Romney refused to put investment dollars into a deal with Artisan Entertainment because he didn’t want to profit from R-rated films. But of greater note to Gay - who once served on the Boston stake’s high council with Romney - was something Romney did for him in 1996. After Gay’s 14-year-old daughter went missing for three days in New York, Romney shut down Bain Capital in Boston and flew about 50 employees to New York to help find her. The girl, who lived with her family in Connecticut, disappeared after going to a concert in Manhattan. Romney and the other Bain Capital executives put their “$1 billion investment firm” on hold, created a “war room” at a hotel, paid to print 200,000 fliers, set up a toll free hotline number and enlisted the help of a private investigator, the Boston Globe reported at the time. They canvassed streets and talked to runaways. The girl was found in a New Jersey home, “dazed from a disorienting dose of a drug,” the Globe reported. It’s not a story Gay likes to retell, though he did record a video testimonial for a campaign ad about it during Romney’s 2008 presidential bid and the story resurfaced in ads this election season, too. But Gay would rather offer other insights, including the time another Bain Capital partner suddenly fell very ill and was hospitalized. Romney was the first person to show up for a visit at Massachusetts General Hospital. Whether Romney’s next purpose will have him sitting in America’s highest political office is now up to voters. And when they cast their ballots on November 6, friends like McBride said where Romney prays on Sundays should make no difference.